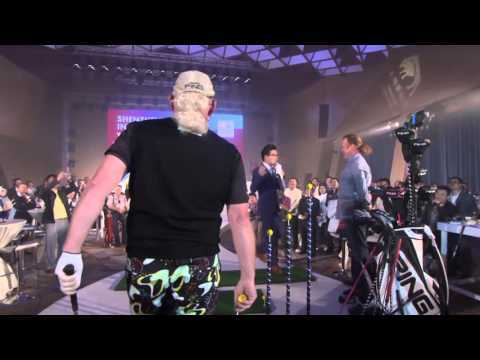 "What a great show, your ball striking was impressive"
"Just amazing &dash; what a fantastic show, loved the video commentary"
"Simply the best, the no.1 in golf entertainment"
David's show is simply the best... over 50 countries worldwide and still travelling. Take a look to find out more about his talents! No 1 in Golfing Entertainment. He is also a great Auctioneer and After Dinner Speaker. A Caribbean trip to the Cayman Islands is the newest date for David Edwards in his busy 2019 schedule. He visits the British Overseas Territory in May for a top Invitational event. David breaks new golf trick record! World Record holder, with his famous Scissor Hands shots - hitting 312 balls in just three minutes! Making your event memorable, the David Edwards on course video commentary will capture those magic moments from your event, bringing lots of laughter to the end of the day.